Description: Greenland and Iceland. Shows voyages of Martin Frobisher. Decorative border and cartouche. Strong impression. 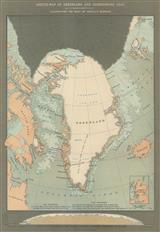 Description: Greenland and surrounding seas. Original printed colour.